This classic sensation novel languished for far too long on my To Read list, despite recommendations from a couple of friends whose taste in books I trust, and who have told me over and over that I must read it. It centers on two half-sisters, Marian Halcombe and Laura Fairlie, who live with their useless, simpering uncle. Walter Hartright is hired as the young women's drawing teacher and he and Laura fall in love. But she is already promised to Sir Percival Glyde and despite her feelings - and warnings from a mysterious woman dressed all in white - goes ahead with the marriage. All too soon, she is sorry. The union sets off a whole series of events that make up a captivating story combining mystery, suspense, and romance. There was almost no question about whether I'd like this book. 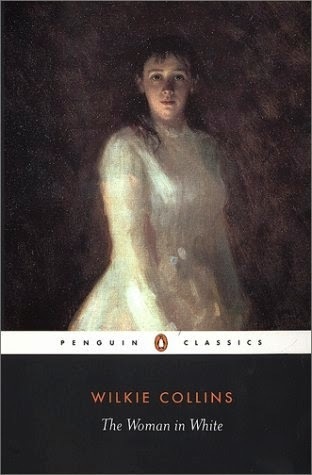 A Gothic novel that inspired Fingersmith and was written by an author frequently compared to Dickens? Yes, please. Everything about it is exactly up my alley, I just kept putting it off because it's so long. Thank goodness for the TBR Pile Challenge lighting a fire under me. The novel is written in first person through several different narrators, switching perspective throughout. This is common enough now, of course, but very innovative at the time. It adds greatly to the feeling of a mystery that we are piecing together as we read. Also rather emblematic of its time, the novel is filled with ridiculous assertions about the characteristics and role of women. I ignored these as best I could. It wasn't difficult as there was so much to enjoy in the book. Here I met some of the best characters ever. First of all, I love Marian Holcombe. She is smart, resourceful, and strong. If I lived in this novel I'd want her as my best friend. On the opposite end of the spectrum is Mr. Fairlie, the weakest most pathetic character since Mrs. Bennett in Pride and Prejudice. In fact, Frederick Fairlie was worse - his infirmities (whether real or imagined) kept him to his room at all times, and he didn't even walk. In one of my favorite passages he actually says "Gently with the curtains, please- the slightest noise from them goes through me like a knife." He is positively insufferable. Count Fosco is another colorful character. This corpulent Italian is secretive and conniving and has a menagerie that includes several birds, and also white mice which crawl over him at will. (Despite having had many pet rats, the thought of little mice crawling about my person positively makes my skin crawl.) Interestingly, Laura, on whom the whole plot centers, is not well-developed or appealing at all, just serving as an object of desire. Her most notable qualities were weakness and fragility. I don't know what Walter Hartright saw in her, besides being pretty, but I liked him anyway. The title character is Anne Catherick, who bears a striking resemblance to Laura and seems to know awful things about Sir Percival Glyde. Uncovering these secrets is a major part of the novel. Ann dresses all in white because as a child she met Marian and Laura's mother, who told her that little girls look their best dressed in white. Neglected by her own mother, Anne latched onto this advice as she remained devoted all her life to the woman who said it. Despite its length, I found it easy to lose myself in this novel and enjoyed it the whole way through, thanks in no small part to the excellent atmospheric writing. "A white fog hung low over the lake. The dense brown line of the trees on the opposite bank, appeared above it, like a dwarf forest floating in the sky. The sandy ground, shelving downward from where we sat, was lost mysteriously in the outward layers of the fog. The silence was horrible. No rustling of the leaves- no bird's note in the wood- no cry of water-fowl from the pools of the hidden lake. Even the croaking of the frogs had ceased to-night." In short, I'm very glad I finally got around to reading The Woman in White. There is good reason it's a classic! Although it did take me over a week to read, it didn't feel long because it wasn't drawn out at all. There were no lengthy descriptive passages or irrelevant sidetracks; it was all important the story and all very enjoyable to read. If you enjoy the classics, this one is not to be missed. Yay! So glad you finally read (and liked) this!